In Galifesto, a young Christian feminist comes of age in an Orwellian Dystopia. Aided by the mysterious computer marvel Mark Atlas, she gathers a circle of unlikely allies through her unitive philosophy of Synergism, working together to build a better world. 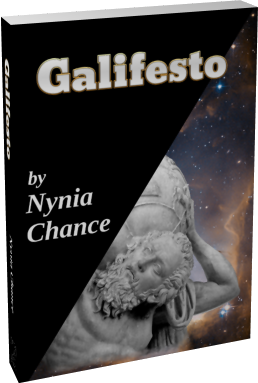 Nexus of Now Media is pleased to bring you "Galifesto: A Love Story"
Read a free sample now! Receive the paperback. Qualifies for free shipping on orders over $35! Read on your Barnes & Noble Nook, or other .ePub reader. Read on your Kobo device or app, or other .ePub reader! Support indie ebook publishing. Libraries may purchase direct, or via Overdrive! Support your local Bookstore or Library! Ask them to order Galifesto through their distributor. Nynia Chance was born the middle child of an average American Christian family in an average American town, graduating from an average American school to drop out of an average college and pursue an above-average career. Deeply grateful for all of the opportunities she received, she works to pay it forward through lovingkindness for all she meets. Nexus of Now Media brings you experiences that help you center in your present moment. Nexus of Now Media is a small publisher of books and music that help in the struggle against the chaos and separation that keeps us from connecting with ourselves, and one another. Our flagship publication, Galifesto: A Love Story will be followed by the audio version, when available. Further Fiction titles are in process, as are music MP3s. This site and products offered above are provided “as is” without any representations or warranties, express or implied. Should there be difficulties receiving or using purchased products, please contact us. No personal data is gathered by this site.